Elliott Erwitt is one of the most misunderstood photographers I have come across. People still treat him as a photographer who is trying to market his work, when Erwitt uses his photography to make fun of life. When he is asked how he captures his images he will always give a glib remark such as "carefully". If you ask of his composition he says he was "lucky". People want to take Erwitt's photographs seriously when the majority of them should make you smile. Even the title of his latest book "Regarding Women" has several meanings, many of which will bring a smile to anyone's face. Open the book and you will see a wonderful forward by Charles Flowers that is all of one page. To give Mr Flowers his due, he does a great job to explain Erwitt in a single page. The page is then repeated in different languages. And that is it, there is no other explanation, wording or introduction to photographs anywhere else in the book. All you are faced with is image after image, some full page, some half page and some small nestled in various other small images. It is supposed to be a book full of images of women, but in typical Erwitt fashion, he even sneaks in a picture of himself dressed as a woman. Making fun of himself just as much as the rest of us. 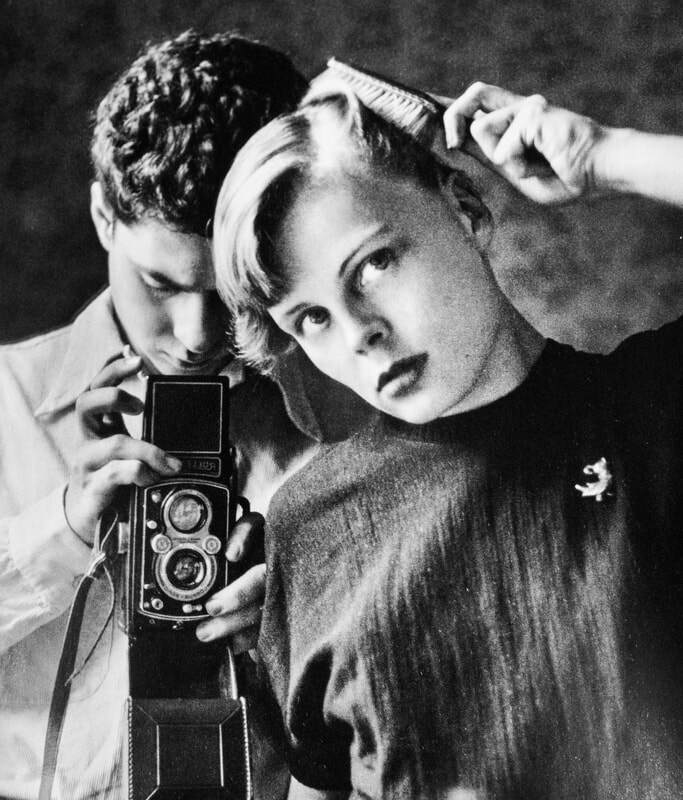 The images cover his photography career with images captured in the 1990's and the 1940's. The one constant is that he never shows an image in poor taste. His humor is not directed at the subject but is directed at the world around her. 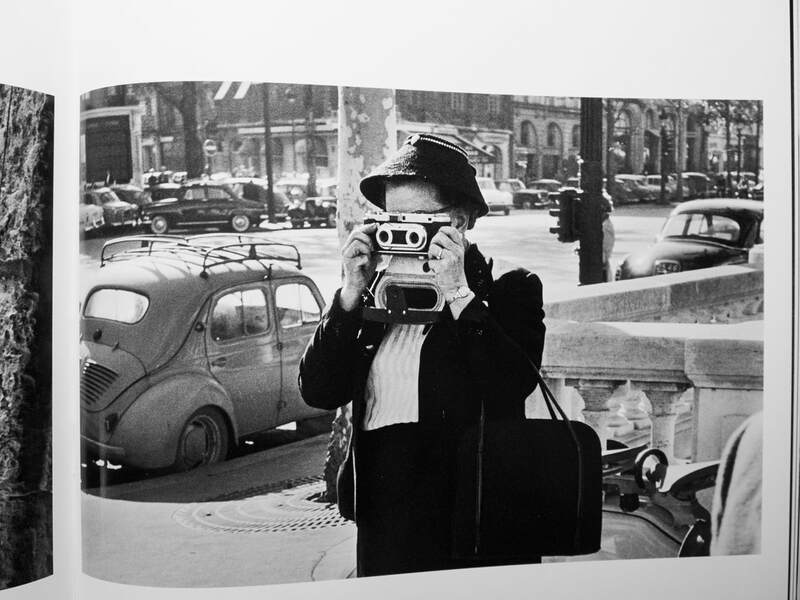 Even the first image of the book opens up with a smile, here we have Erwitt photographing a young woman in a mirror capturing himself as well. I cropped the image a bit here for the website but the full image is amazing. The women in the book are a mixture of models, street photography subjects and his own family members. He includes some of his most famous pictures of Marylin, Kennedy and Nixon along with women we will never know. The book succeeds in capturing Erwitt's style and eye. His ability to quickly spot an ironic twist in life, compose it perfectly and capture it unseen is remarkable. He does not take himself or his work seriously so he is not bound by an over abundance of pride, something that other greats suffered from (Henri Cartier-Bresson comes to mind). 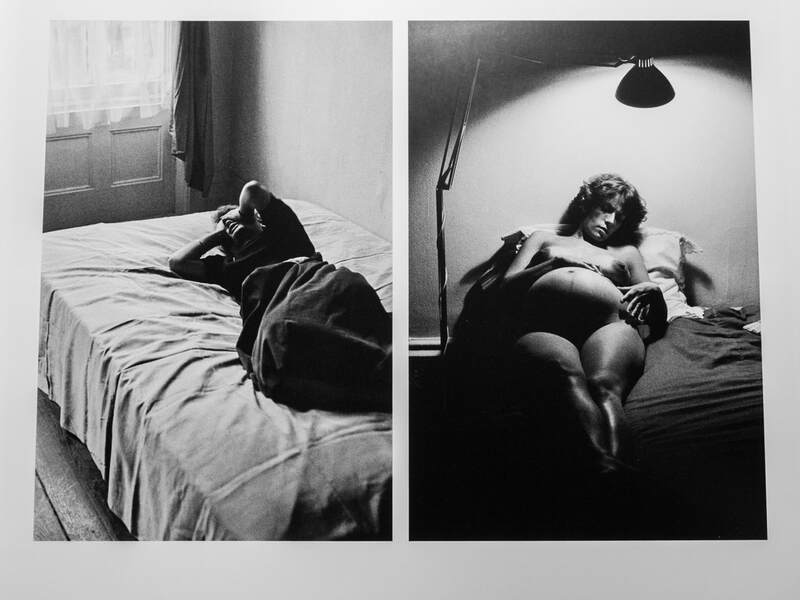 The images do not follow a chronological time frame, not in the time the image was shot, and not in a woman's life. But he covers all aspects of a woman's life, from youth through to old age. He also covers various emotions, from happiness, anger all the way to images of complete loss. All images respect their subject, and many will cause you to smile as you see the ironic nature, or hidden question that he is asking us. Some of the images are serious and force you to confront emotions that are very powerful. Taken all together, the book imitates life, the happy and the sad. The book has over 300 images and with the absence of any text, allows you to immerse yourself in each one. I found myself looking for context in the image and each time I open it I find another favorite image to enjoy. Some images are very well known, while others I have never encountered before. It seems that Erwitt dug deep into his negatives to put this book together and I am grateful that he did! The print quality is wonderful, with thick pages, wonderful reproductions and is well laid out. This is a book to keep for generations to enjoy. To the right you see a famous image that was almost completely ignored. 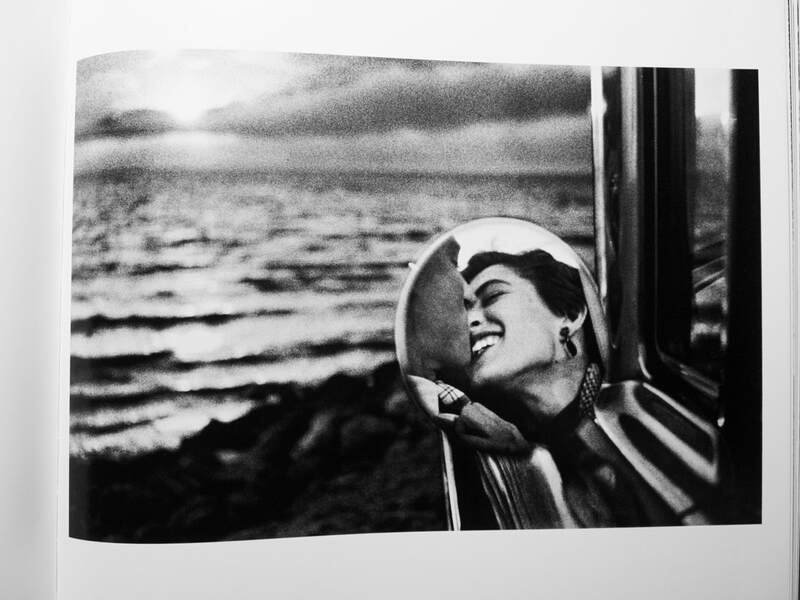 The story I heard of this reflected kiss, is that it was taken while Erwitt was on vacation. It was stuffed into his Magnum archive and ignored. It was rediscovered thirty years later and now we have this amazing image of a reflected kiss from California. The focus is spot on, the landscape is wonderfully exposed and the result is a memory none of us experienced but we can all remember it well. As mentioned, not all images reflect the positive aspects of life, his photography does touch on difficult moments that woman go through. 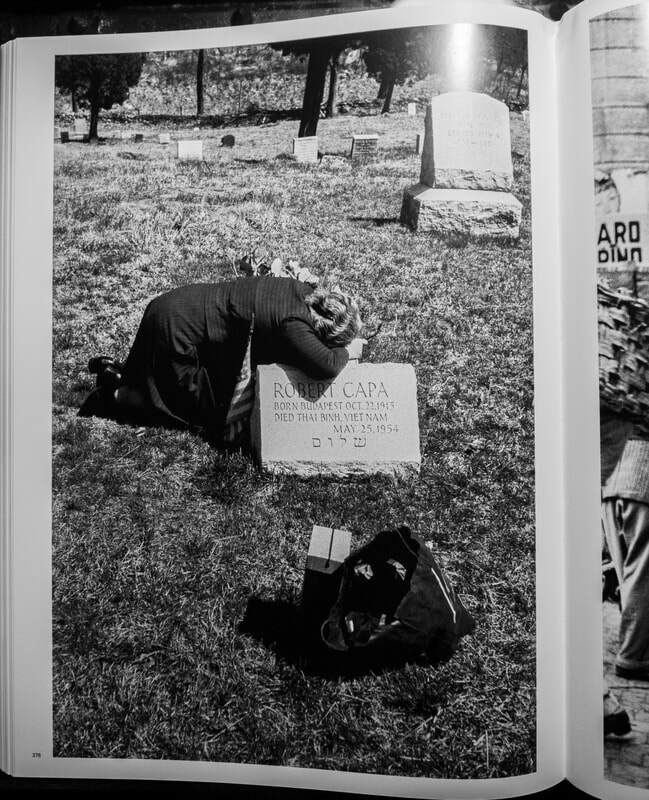 Here we have Robert Capa's mother crying over his grave. An image I have never seen before. Overall the book is a wonderful addition to my library. 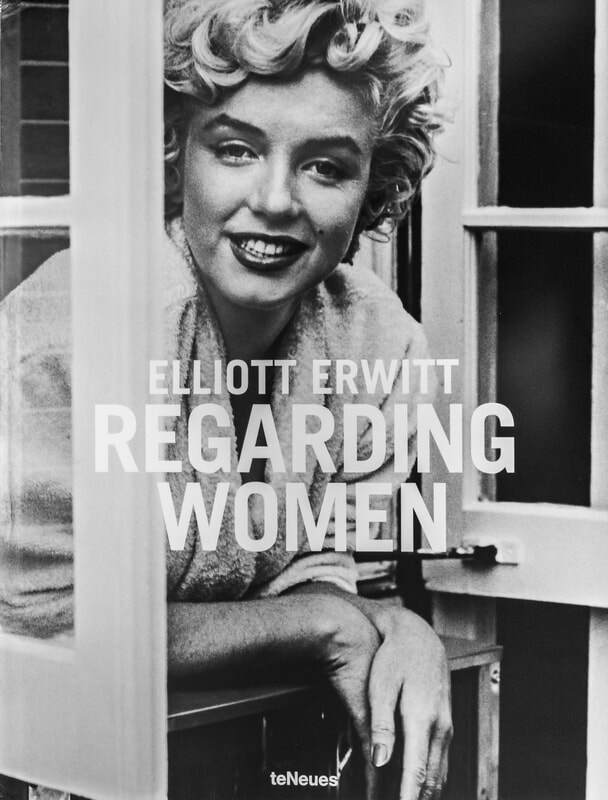 I heard about the book during a talk that Erwitt gave when he mentioned he was putting this book together. Even then, he knew the title of the book. I finally took the chance and ordered it, having it shipped from the UK to Indonesia and was so thankful when it actually arrived in good condition. Don't buy this book to understand Erwitt, I doubt anyone will ever understand him well, but if you want to see page after page of the best of his work, this is a book for you. Forget the text, forget the context just sit back and drink in his amazing talent, wonderful sense of humor and the irony of life.